CONGRATULATIONS #110 Bobby Campbell, the winner of our Corel Paint Shop Pro Giveaway! Back in my early days of digital scrap booking, when I actually feared the computer - I used Corel Paint Shop Pro to create what I thought was then beautiful digital masterpieces. Those pieces now stay hidden in the closet due to shame, but that is not because of Corel, but because of my inability to be creative! Corel Paint Shop Pro was a constant activity in my home that let me create fabulous scrapbook pages of my new baby girl, allowed me to fix those lousy images with their almost automated tools and to be as creative as I wanted without the cost of paper and supplies as in real scrap booking. These are just a few of the options this program has included in the latest update. Corel has generously donated one copy of this amazing program for our Cool Photo Ideas readers! 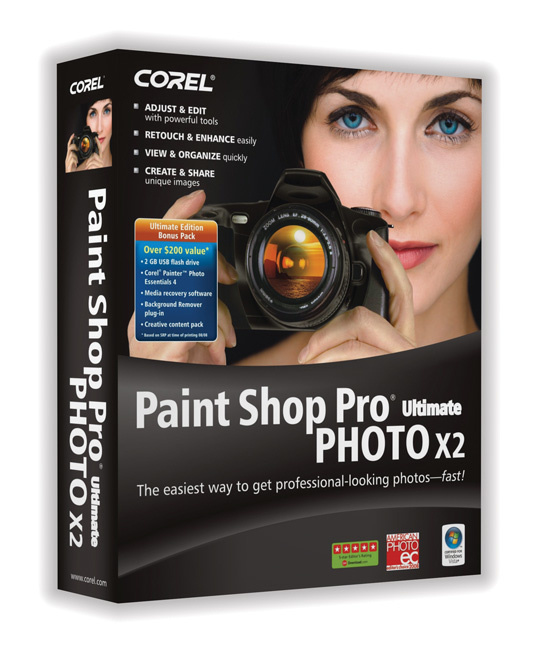 One winner will receive a brand new copy of the amazing Corel Paint Shop Pro Program! 1) Simply leave a comment and let us know why you have to have this software! 2) Earn and extra entry by signing up for our RSS feed (check out the cute panda at the top of the blog), and yes we can tell!!!!! 3) Earn another entry for posting about this giveaway on your blog or adding us to any social media site, please leave your website or a link to the social media hit you have given us! One winner will be chosen at random using Random.org and will be posted here by February 11, 2009. Winner has 3 days to claim prize, if no response is received, another winner will be selected.